Todd and I spend our last day in Donostia-San Sebastián with the Baron and Baroness hiking Monte Urgull and making DIY picnic pintxos from bread, jamón, romesco sauce, and queso while sheltering from the rain under a centuries-old stone archway. 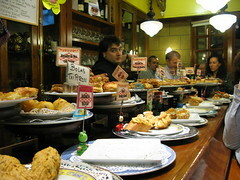 We end with an evening filled with rounds of txakoli and many plates filled with the foodie heaven-on-a-toothpick. 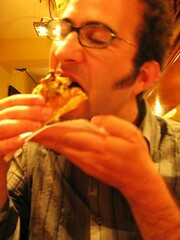 You know you are too comfortably co-dependent with friends when the four of you take a bite out of the same pintxo. Since it’s approaching midnight, the Baron and Baroness don their backpacks and head off to catch their overnight train to Barcelona. Having had enough overnight trips for a while, Todd and I have opted for an early morning bus instead. We’ll meet up tomorrow in Barcelona. While Todd hits the shower, I hustle to get ready for bed since my belly full of pintxos is already putting me to sleep. I hear an unfamiliar noise coming from Todd’s daypack: it’s his cell phone. Before I answer, I realize this can be nothing good. There are only two people that have our temporary Spanish phone number, and they should have boarded their train by now. Todd comes back from the shower and I break the news. Lest anyone get the wrong idea, the Baron and Baroness are among the smartest people we know. They survived a long winter night of sub-zero temperatures by building a snow cave. They’ve renovated a house from the damages wrought by a chain-smoking, hoarding, senile old woman. They designed a monumental shade structure that safely sheltered thirty people from apocalyptic dust storms at Burning Man. We’re not just saying this because we might need to live in their guest room for a while if go over budget on our round-the world trip. Soon enough, the Baron calls back. There’s no way they’re getting out of San Sebastián tonight, so they’re on their way back to our hotel, Pension Arsuaga. After I hang up, I unfold the handy 1980s style convertible foam chair/bed – which had seemed superfluous and tacky until now – layer some extra blankets, and unfold our travel sheets to arrange two makeshift beds on the floor. Thanks guys, for all the qualifiers of how we’re not prone to such activities! You did the story up good. I’m glad to see you’re catching up with your posts. Keep ‘em coming!